This week, show us something creepy — because hey, we can’t take photos of rainbows and puppies every day. Well, okay, I guess we can. But let’s branch out anyway! I few weeks ago, I got lost in a craft store while looking for some plain ol’ Elmer’s glue. I became badly disoriented by the variety of glitter colors, shapes, and sizes available in the party supplies section, when I turned and found myself face to face with a display of tubes filled with multicultural plastic babies. That’s right, tubes of plastic babies. It was creepy. If there’s anything that will snap you out of a glitter-induced fugue state in a hurry, it’s a near-collision with thirty-five square feet’s worth of plastic babies — that’s 3.25 square metres for y’all not in the US. 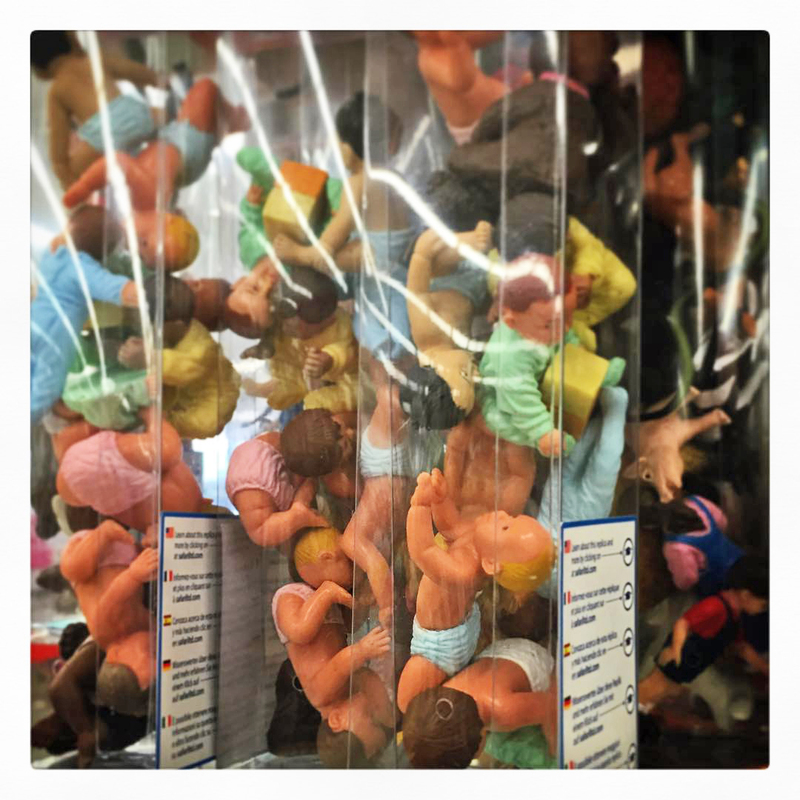 The dolls were thrown into the tubes willy-nilly and the tubes themselves were hung vertically, creating a dizzying, chaotic cascade of babies. Each doll was only about four inches long, so the five-by-seven foot display contained hundreds of babies; maybe thousands. Obviously, I had to take a photo (thanks, cameraphone!). Then I grabbed the nearest tube of glue-like substance and got out of dodge. This week, share an image of something creepy. Unsettling. Eerie. Disgusting. Go goofy, as I have. Grab a shot of something you find disturbing, but few others do (I’m looking at you, sister-in-law who’s creeped out by balloons). Try a black-and-white shot of something you’d normally photograph, to give it a moody cast. We can go back to inspiration next week — this week, give us some heebie-jeebies! *It is not entirely lost on me that I seem to have a preoccupation with little plastic babies. At least I didn’t name these? That really is creepy, Michelle! Off to see what I have. hahaha, this will be funny. Oh, man — I have just the shot… something straight out of the Blair Witch Project. However, it’s on film that I haven’t processed yet, so that’ll have to be tomorrow. Interesting topic. I went with halloween. Great topic …. creepy great image – but I doubt I will have anything for this week. Have a nice weekend, Michelle. Yikes, those ARE creepy, Michelle. I really don’t like dolls. I find lots of things creepy enough to photograph. Enjoy. I think? I actually guffawed when I read this. LOVE your description. Great topic, found the matching photo just today on the street during my visit to Leipzig, Germany. 663 Responses While this challenge is closed to new entries, we encourage you to visit the Reader to find other avid bloggers. xoxogossipwhale First ever ghost seal? Creepy? … What Do You See? Compendium of Crazy Creepy you say? Creepy: Weekly Photo Challenge – The Unstoppable Optimist! Eye Candy Visionz Hang In There. Renae Rude You want creepy? My whole blog is creepy! Etcetera Etcetera Etcetera Is this the real life? Lardeau Valley Time I’ve Got Creepy Covered! An Upturned Soul Why do we see something strange when we stare at ourselves in a mirror? honestme363 Would You Walk into this Building? Never Trust a Jellyfish Creepy Enough For You? Ontheland Weekly Photo Challenge: Idling–Unsettling or Creepy? like mercury colliding… Blogging 101 Day Thirteen…Something Creepy! Welcome to Evelyn's Photos! What are you afraid of? del's other stuff… creepy? what’s creepy! Heart Cloud Blessings What is creepy to me … might just surprise a few. NihongoJapango Somewhat creepy not to mention expensive! This*Day*In... Page 229: Creepy? Depends. Atypical 60 Creepy. Creepy. Makes Me Weepy! Dandelion Fuzz Cute or Creepy? A Yooper Story Spiders, Spiders, Spiders Everywhere There Are Spiders. The Worlds Inside Our Minds Fluffy ate Something and now he’s MEAN! An Artist at Heart Plastic Surgery Gone Terribly Wrong! Michelle Lunato Photography Creepy. Witnessing the Circle of Life. Susie Lindau's Wild Ride Creepy or What? Jill's Scene Two go boating in Lumpini Park. Eye Candy Visionz How Many Hands Does It Take To Creep You Out? Julia's Odyssey Creepy – Bone Ships from 1903. Musin' With Susan: Capturing Moments That Are Gone Forever Now That’s Creepy! The Temenos Journal did I mention a bat once pooped on my head? Life through my eyes. Creepy. A Simple Note Creepy. In a beautiful way. La vie est trop courte pour boire du mauvais vin Run! Genieve Dawkins – Author Blog WPC: Creepy or Otherworldly? snowpartridge WPC: Creepy or Cute? La giraffa Creepy and painful. Rolbos © Weekly Photo Challenge: A Creepy African Fairytale. The Imaginary Bureau Weekly Photo Challenge – Creepy! Memos from a Retired Hippie Chick My Other Life is Purple…. Ouch!! My back hurts!! Creepy – Yikes! nivs24 Creepy: Me as Cousin Itt. Hehe! The World Through My Eyes Halloween Already? Under A Pile of Photos What Waits in the Fog? Fill Your Own Glass Weekly Photo Challenge – Creepy? So where's the snow? Nature being creepy…..
MLou's Photography Blog Creepy Lookin…But Oh My! Tastes Soooo Good! scillagrace Weekly Photo Challenge: Creepy! From Hiding to Blogging What is its POV? Doublewhirler DOES THIS DOLL MAKE ME LOOK CREEPY? From Hiding to Blogging Who is He?